Home / Longarm Machine Quilting Class / APQS Beginning Longarm Class is August 3! APQS Beginning Longarm Class is August 3! In this class we’ll cover a huge variety of topics including setting tension, thread choice, batting choice, multiple ways to load a quilt, how to set up a pantograph, how to realign a pantograph for subsequent rows, how to deal with problem quilt tops and touch on very basic custom quilting as well as maintenance and some business topics. That’s quite the agenda! But, I also want to make sure my students leave here with all of their questions answered. If you have a question about your new machine that isn’t covered in my list, we’ll be sure to spend some class time answering your questions too. This class is FREE with the purchase of a longarm machine from APQS. If you do not own an APQS machine you are still welcome to take this class for $200. While some items in the class will be APQS specific, most will apply to any brand. I’ve had lots of people take the class who own other brands and they’ve all found it to be incredibly helpful. Plus, you’ll leave with a big 40+ page booklet too! You can register for the class here and prepay. Or, if you get the class free because you bought an APQS machine, call Angela at (502) 718-7148 to register. While this class covers a variety of topics, there’s still so much more I want to teach but can’t fit it into the day. So the next day, Saturday August 4, I’ll be teaching the Advanced Beginner Class as a continuation of the APQS Beginning Longarm Class. This class offers a broad over view of custom quilting. During this lecture/demo class we will learn over 100 ways to custom quilt a block. Learn easy custom border/corner/sashing treatments. See how to “read” a quilt top and interpret a quilt top to select the best design and organize your inspiration. Explore beginning ruler work and learn how to safely use rulers with your quilting machine. This class offers the birds eye view of custom quilting so you are ready for more focused and rigorous classes. This class also comes with an extensive handout. The Advanced Beginner Class is $125 and you can register for the class here. Because this class goes hand in hand with the APQS Beginning Longarm class, many students will wait to register for the Advanced Beginner class until the day before. 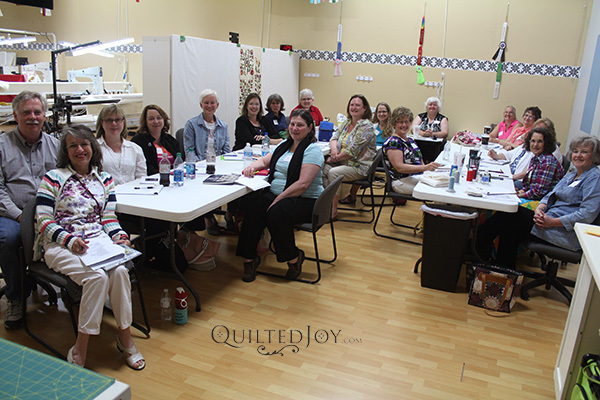 Both of these classes are perfect ways to learn the basics of longarm quilting!